A Gepner model (Gepner 87) is a rational 2d SCFT which is a tensor product of N=2N = 2 super-minimal model CFT. This means that Gepner models are “non-geometric” in that they do not arise as sigma-models with target space a smooth manifold. 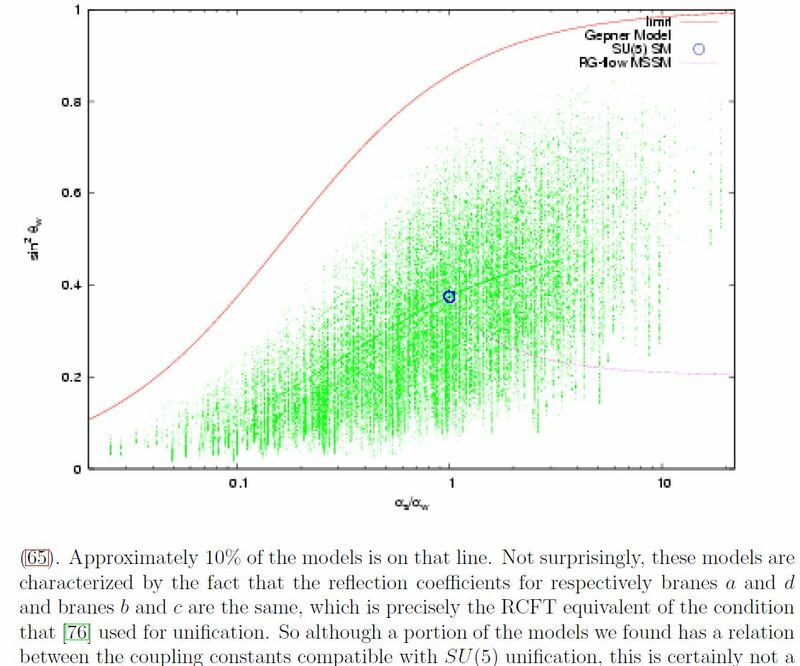 Indeed the Gepner models appear as the limiting cases of sigma-models with target space a 6d Calabi-Yau manifold at singular points in the moduli space of the CY target: the flop transition. As such the Gepner models are directly analogous to the purely algebraically defined non-classical fibers in the Connes-Lott-Chamseddine-Barrett model (it is a “2-spectral triple”-analog of the spectral triples in the Connes-Lott model, see there) and, accordingly, plays a central role in string phenomenology (for review see e.g. Reppel 07). The Gepner models are a basic building block for rational conformal field theory. All the known rational boundary states for Gepner models can be regarded as permutation branes. A plot of standard model-like coupling constants in a computer scan of Gepner model-KK-compactification of intersecting D-brane models according to Dijkstra-Huiszoon-Schellekens 04b. The blue dot indicates the couplings in SU(5)SU(5)-GUT theory. The faint lines are NOT drawn by hand, but reflect increased density of Gepner models as seen by the computer scan. Doron Gepner, Space-time supersymmetry in compactified string theory and superconformal models, Nucl. Phys. B296 (1987) 757. See also the references at flop transition for more. Last revised on April 8, 2019 at 04:58:40. See the history of this page for a list of all contributions to it.